The use of vermiculite as a vitamin carrier for fluid vitamins is also conceivable. The refined vermiculite was used for the first time as a homoeopathic medicine in the 80s. 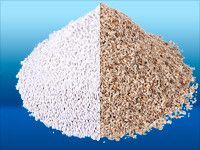 In India, vermiculite initially proved successful on animals and was then also used successfully for humans. It was established that vermiculite has an above-average healing effect in degenerative and inflammatory illnesses in the joints. A homoeopathic congress in Germany was made aware of vermiculite as a medicine initially. Vermiculite was used on persons with weak bones, but also on patients with inflammatory, rheumatic complaints. The initial treatment success could soon be shown. In veterinarian medicine in Germany, the results of the Indian doctors were able to be confirmed, especially in treating hip joint complaints. The good successes experienced in humans and animals are making Vermiculit more popular and well-known as medication. Please consult your doctor or chemist for the indication of vermiculite. No side-effects are known as yet. Used particularly well after mixing with milk products!